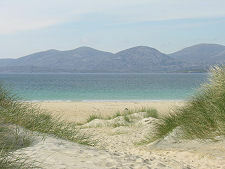 Harris is not an island, despite usually being talked of as if it is. 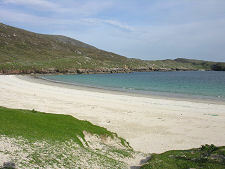 Rather it's the southern third of the largest and most northerly of the Western Isles, most of which forms Lewis. Some say the distinction between the two dates back to a split in the MacLeod clan which dominated the Western Isles for centuries. 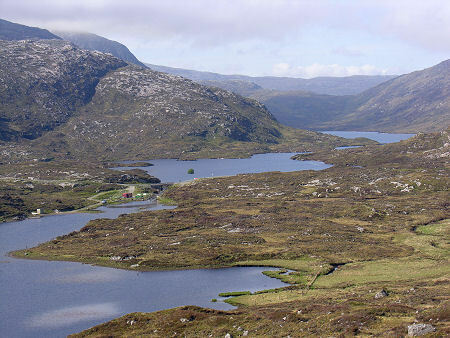 Others simply point to the range of high mountains that impeded land access between Lewis and Harris, turning them into virtually separate islands. 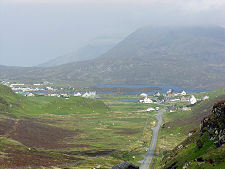 The border between Lewis and Harris follows Loch Resort in the west and Loch Seaforth in the east, and an imaginary east-west line crossing the six miles of high moorland between them. 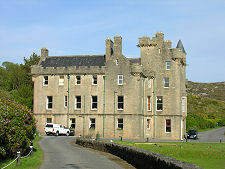 Until 1975 the distinction was preserved in the organisation of local government, with Lewis being part of Ross and Cromarty and Harris part of Inverness-shire. This changed with the sensible creation of the Western Isles Council, now known as Comhairle nan Eilean Siar, looking after the interests of the entire island chain. 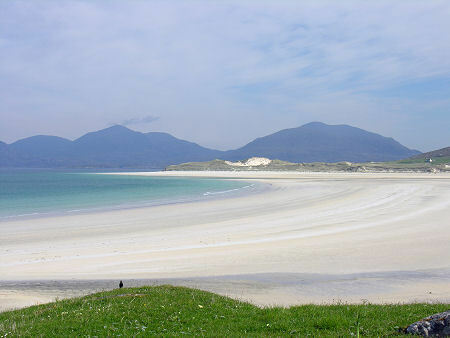 Harris is characterised by high mountains, deeply indented sea lochs, coastal islands, and beautiful white beaches punctuating the predominant grey rock and green heather. 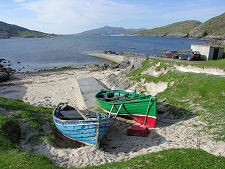 Anyone who loves the far north west of Scotland will be drawn to Harris: the character is different and distinct, but many of the elements are the same. The road from Lewis enters Harris at the north west tip of Loch Seaforth and then heads generally south east, providing some superb views down to and along the loch, and towards the wall of mountains ahead. 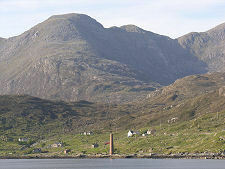 Dominating the scenery is Clisham, the highest peak in the Western Isles at 799m or 2622ft. Watch out for a minor road to the left descending to Maraig on Loch Seaforth. This leads via a new road carved out of the rock to the attractive settlement of Reinigeadal at the mouth of Loch Seaforth. Some miles further on is the junction with the B887 on the right. This is 15 miles of challenging single track road leading past Bunabhainneadar to the superb scenery at Huisinis and the abandoned island of Scarp; and includes a drive past the front door of Amhuinnsuidhe Castle. 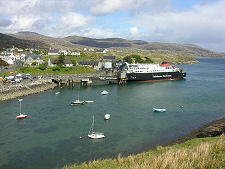 The village capital of Harris is Tarbert, which is also the ferry terminus for Uig on Skye. 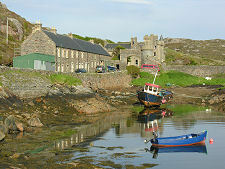 A minor road east from here leads over the Scalpay Bridge to the busy fishing island of Scalpay. Tarbert lies at the point where Loch Tarbert and West Loch come within a few hundred yards of turning South Harris into a separate island. Heading into South Harris the main road crosses to the north west side of the island, which it follows past the spectacular Luskentyre Beach and wonderful views taking in the deserted island of Taransay. It then curves round to reach Leverburgh, which was, until his death in 1925, the focus of Lord Leverhume's efforts to revolutionise fishing in the UK. 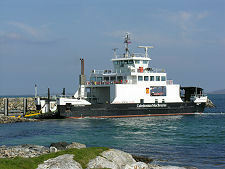 More recently it has boomed since the introduction in 1996 of a direct vehicle ferry across the Sound of Harris to Berneray and North Uist. 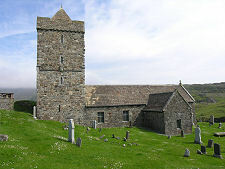 From Leverburgh it is possible to continue to Rodel, with its medieval St Clement's Church. 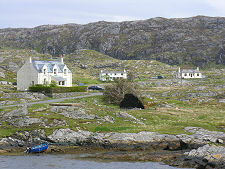 From Rodel you can return to Tarbert along the Golden Road, which wends its way through a series of small settlements strung out along Harris's south east coast. Visitors to Harris should be aware that Sunday observance remains strong here. Transport links to Lewis and Harris are now more readily available on a Sunday than they used to be. But many shops, petrol stations, cafes, pubs, and visitor attractions are closed on Sundays. Sunday observance is part of the culture of Lewis and Harris, and part of what makes them unique. However, given the difficulty in accessing services on a Sunday, our advice would be to ensure you know exactly how your food, drink, transport and accommodation is going to be provided in advance if your stay includes a Sunday.